There’s something about the smell of cinnamon & spices at Christmastime! Perhaps it’s the rush of childhood memories of making cookies in the kitchen with mom, or the little gifts that we would make in school? Or maybe it is the smell of pumpkin pie our family would share every Christmas evening that I remember so well? Whatever the reason, nothing says we’re ready for the holidays better than something sweet & spicy being prepared in the kitchen! These little ornaments have been warming hearts & homes for many years, and with proper care, they can last a very long time. In fact, the ornaments pictured above are ones that I made several years ago that I still enjoy! All it takes is a simple mixture of applesauce & cinnamon to create beautiful items for your home! Mix in a bowl and stir until well blended. Work mixture in hands for several minutes to form a ball. If mixture is to dry, add a bit more applesauce. If it’s too wet, add a bit more cinnamon. Knead ball on cinnamon sprinkled surface until it holds together well. Then, roll out using a rolling pin sprinkled with cinnamon. You can use your favorite cookie cutters, or templates that you’ve drawn yourself to cut out your shapes. 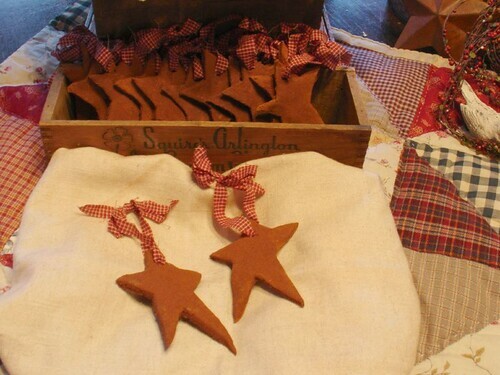 As you can see by the picture, for this batch, I chose to use a template of some little primitive stars for our shapes. I like the ornaments to be a little bit thick. This helps keep them from breaking over the years. Air dry for 24 to 48 hours – turning several times. You can also place the cookie sheet in a very low oven (around 200 degrees), which will help them dry much faster. Remember to turn several times. When you pack the ornaments away, be sure to cushion them to keep them from breaking. And, if they start to loose their scent over the years, add a drop of cinnamon oil to bring back the wonderful aroma! Save money and make this a VERY inexpensive project! – Buy your cinnamon in the generic containers from the super-mart or the local discount store. I can usually find larger containers of cinnamon 2 for $1. – strips of homespun fabric – my favorite, as I buy it at super-mart for $1 pr yard! 1. Decorate a small Christmas tree using only these ornaments, then as your guests leave, take an ornament off and give it to them as a little gift. 2. Use as gifts for teachers, the postman, your hairdresser, or any other person that you need to give a little special something to. 3. Use them as a gift tag or package decoration by using paint to write the person’s name on the ornament. 4. Do you make baked goods or jar mixes as gifts? If you do, add one of your ornaments to the jar or package by using a strip of homespun fabric to tie it on. 5. Use your ornaments to make a beautiful garland! 6. Add to a wooden bowl of things such as; potpourri, rusty bells, cinnamon sticks, whole cloves, apple rings, and dried orange slices. 7. 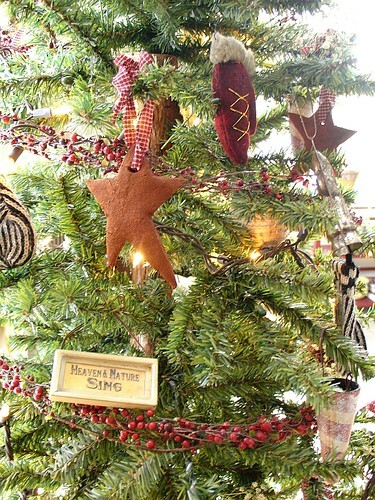 You can add extra touches to your ornaments with acrylic paints, or glitter. 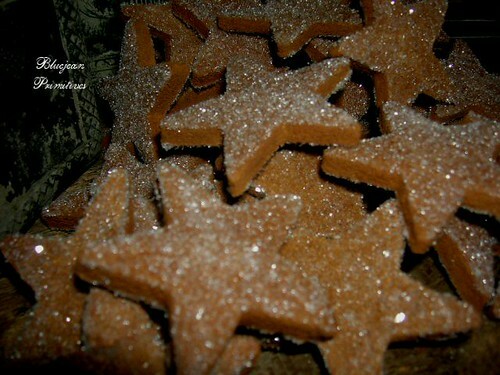 You could also dip them in wax, then roll them in cinnamon for a wonderful “grubby” prim look! It doesn’t have to be Christmas for you to make these creative little beauties! How about hearts for Valentines Day, flowers for Mother’s day, and stars for the 4th of July! And, I know of many people who like to keep a little primitive style tree up all year long. They have the lights on it, and then they decorate it according to the holiday or season in which they are in. You don’t have to make them yourself! If you love the thought of using these creative little ornaments, but don’t have the time or energy to make them yourself, I still have the perfect plan for you! Check out all of the other wonderful things she has there – including some beautiful fabric covered primitive boxes! Here are her beautiful little stars!